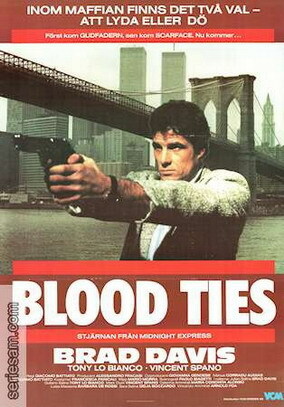 Blood Ties, also known as Il Cugino Americano in Italy (The American Cousin), is an Italian TV mini-series directed by Giacomo Battiato. It was shown at the 43rd Venice International Film Festival in its full length version (4 hours), where it was awarded The Golden Lion as best television production (the first time this category was ever created and awarded). The mini-series was cut down to 90 minutes and broadcast as a TV movie on Showtime. Brad Davis stars as Julian, who finds himself blackmailed by Sicilian gangsters into a plot to assassinate his cousin (Tony Lo Bianco), who is a judge in Sicily fighting the Mafia. Leading the modern day Mafia between America & Sicily, is early twenties “Baby Mafia” capo Mark Ciuni (Vincent Spano), whose economic degree from Princeton powers his prowess in creating great profits for the deadly world of the Sicilian controlled drug trade. Spano was nominated for an ACE award for his wicked performance.